Mississippi Gov. Phil Bryant signed an anti-LGBT bill into law today that will allow businesses and government workers to refuse services based on their religious beliefs. "This law uses the guise of ‘religious freedom’ to justify discrimination,” said Jody E. Owens, managing attorney of the SPLC’s Jackson office. “It’s the same sort of rationale used in earlier eras to justify slavery and Jim Crow. LGBT Mississippians deserve better. We need to stand up for the rights of all people." 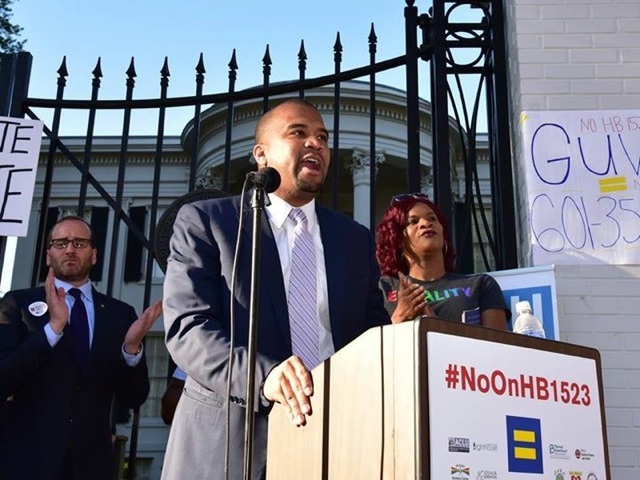 On Monday, Owens spoke at a rally with other activists and civil rights groups outside the governor's mansion in Jackson, Miss. The “Protecting Freedom of Conscience from Government Discrimination Act,” passed last week by the Mississippi legislature, is slated to go into effect on July 1. It will have immediate consequences. The Mississippi Chamber of Commerce, the Mississippi Manufacturers Association, IBM and AT&T were among the business groups and companies that released statements urging the governor not to sign the bill into law. Mississippi follows a number of Southern states in taking up “religious freedom” legislation, bills that are often pushed by hardline anti-LGBT groups. Tennessee is considering a bill that would restrict bathroom access to transgender students based on the gender identity assigned on their birth certificate. North Carolina’s law similarly limits transgender access to bathrooms and voids locally enacted protections for LGBT workers. The North Carolina law has sparked a national outcry in the past week, and more than 100 corporate executives signed onto a letter urging its repeal.